Do you know if your water heater is about to fail? Other than knowing how old the water heater is, most homeowners have no idea when their water heater might give out. Zip. Zilch. Nada. Have you begun to notice your bathwater or kitchen faucet giving off a rusty residue? This could be an indicator that your water heater is rusting away on the inside. Interior rusting can lead to leaking—so it’s best to have a professional investigate rusty water before it becomes a major disaster. If you have galvanized piping, you might not have to worry quite as much. This could simply mean you have rusty pipes (not a rusting water heater!). As your water heater ages, it builds up sediment inside—and when heated, the sediment can become hard. If you hear banging and rumbling noises in an older water heater, it’s likely an indication of too much sediment and could mean your water heater is close to failure. 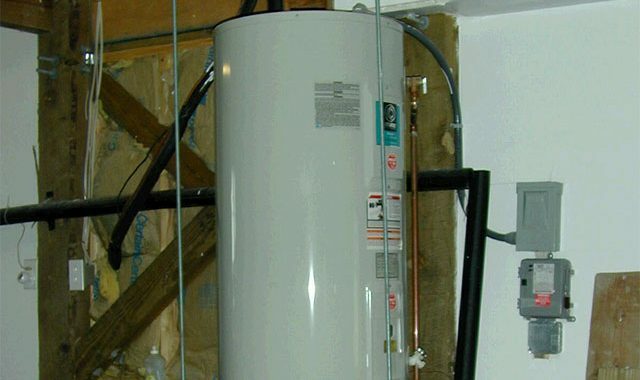 Noticing excess moisture around your water heater? This could indicate a small leak or a fracture in the water heater’s tank. Water leaks are never a good sign—and can mean water heater service, repair, or replacement is just around the corner. Remember, most water heaters are built to last somewhere in the neighborhood of 10 to 15 years. If your water heater 15 years old (or older) it’s best to have a licensed professional assess your unit and discusses replacement options—no matter the signs or symptoms. Choose Good Guys Home Services—the Fort Collins water heater experts. You won’t have to fret about your water heater’s performance ever again. When it comes to repairing all aspects of your home’s plumbing system choose the locally owned business that takes pride in living up to its name. Whether you need assistance while remodeling your home or need us during an emergency water heater failure, you can rely on the experienced staff at Good Guys Home Services. Contact us online today or give us a call at (970) 818-8008.